Authentic Mexican granulated chocolate drink mix. Same Great Taste, Easy to Prepare. No cholesterol. Comes in Resealable Pouch. 20 servings per bag. Its Good to Remember: Prepared with milk, each cup of Nestle Abuelita granulated chocolate mix is a delicious way to help meet your daily calcium requirement. Preparing a perfect cup: Stir 1 heaping tablespoon (20 grams) into 1 cup (6 ounces) of hot milk. Enjoy! Preparing a perfect liter: Stir 4 heaping tablespoons (80 grams) Nestle Abuelita into 4 cups (24 ounces) of hot milk and enjoy with family and friends. Ingredients: sugar, alkalized cocoa liquor, cocoa powder, cocoa processed with alkali, maltodextrin, dicalcium phosphate, and less than 2% of sodium caseinate, non fat milk, soy lecithin, lactose, artificial flavors. Autentico chocolate Mexicano granulado para mesa. Mismo gran sabor, facil de preparar. Viene en paquete con cierre hermetico resellable. Sin colesterol. 20 porciones por envase. Es bueno recordar que: preparando con leche, cada taza de Nestle Abuelita granulado sabor chocolate es una manera deliciosa que te ayudara aportar el calcio necesario de cada dia. Para preparar la taza perfecta: Mescla 1 cucharada colmada (20 gramos) de Nestle Abuelita en 1 taza (6 onzas) de leche caliente. Para preparar una jarra de 1 litro: Mezcla 4 cucharadas colmadas (80 gramos) de Nestle Abuelita en 4 tazas (24 onzas) de leche caliente y disfruta con tu familia y amistades. azucar, pasta de cacao alcalinizada, cacao en polvo, cacao alcalinizado, maltodextrina, fosfato calcio dibasico y menos del 2% de caseina de sodio, leche descremada, lecitina de soya, lactosa, sabores artificiales. chocolate drink awesome gift to your taste buds enjoy it we didi !!!! and we strongly recommend it we will buy again ( I don't know about you ) buy we will. buy again. I love this product. I live in the New York state and I called and asked my family from chihuahua what is the best hot chocolate to keep me warm in the winter. 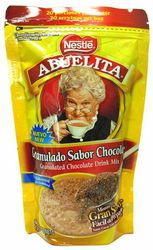 They told me try abuelita and during winter season it is amazing. ProsThe flavor reminds me of my family in Mexico.